Urban street writing is a movement so massive, so global that it is impossible to miss. Yet many people seem to ignore it. This blog is the work of a class of 17 freshmen at the University of Michigan who chose to understand it better. 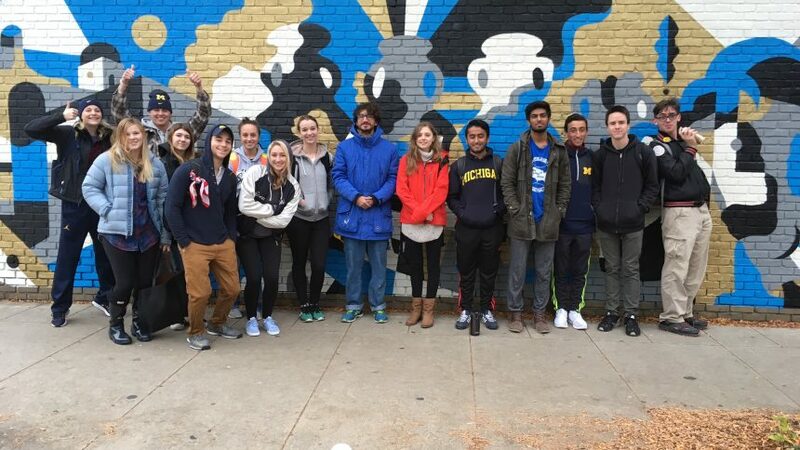 In “Writing on the Wall,” a freshmen writing class taught by Professor Artemis Leontis in the fall of 2016, we spent 14 weeks studying the phenomenon known as graffiti and street art. Our learning took several forms. Of course there was book learning. We read a comprehensive book on the subject of Graffiti and Street Art by Anne Waclawek and several wonderful articles from the Routledge Handbook of Graffiti and Street Art. We took time to understand the movement’s history, rules, codes, styles, ethos, and pesky terms and definitions: tags, pieces, and throwups; writing vs painting; graffiti and street art; unsanctioned vs sanctioned works; uncommissioned vs commissioned works; vandalism, copyright, trademark, and bombing. We also read an article by Claire Taylor on the “strange epigraphic habit” of quarry workers in ancient Athens. We read other articles and studied graffiti writers and writing in Athens’ present-day neighborhoods of Exarcheia, Psiri, Gazi, Keramikios, Plaka, Anafiotika, and Metaxourgeio. Additionally we visited the Kelsey Museum of Archaeology to study how material objects are curated and to learn about a graffiti conservation project in an ancient underground stone-carved temple in El Kurro Sudan. In the museum, thought about the challenges of conserving a form of writing that is by all intents and purposes never meant to stick around. Some of our learning was practical. We created and circulated (legally) our own tags and wrote about what it means to “make a name” in signature graffiti culture. We walked around our neighborhoods looking for graffiti, then photographed, categorized, documented, and wrote an essay on the work. We also met two very creative artists from Athens, Olga Alexopoulou and Cacao Rocks, and watched them create new murals in Ann Arbor. We talked to them about how they work. Cacao gave us the opportunity to test the steadiness of our hand on a mural we made with him. Mostly we discussed and wrote. We held one class debate on a controversial issue: the removal and sale of Banksy’s “Slave Labour” in 2013. When preparing our debating briefs for this and another controversial story (the enormous graffiti covering one of the buildings of the Athens Polytechnic, a national monument, in March 2015), we discovered just how tangled the ethical and legal questions are that surround graffiti. Unsanctioned art that is unsigned or signed pseudonymously on public walls doesn’t fit easily into the law! Moreover, it raises the question of access to public space. Who has the authority to decide what’s seen and said on public walls? Thus we thought very hard about the “public” element surrounding many works. What is public, who is the public, and who determines the fate of urban street art? What changes when street art is removed from the streets and sold to private collectors? Following our class debate, we wrote our third essay, this time on a controversy surrounding a graffiti piece. Cacao Rocks with students on October 26, 2016 at the corner of Thayer and N. University, Ann Arbor. Photo by Artemis Leontis. This blog, “Graffiti through the Looking Glass,” is our last writing exercise. The title comes from Lewis Carroll’s Alice through the Looking Glass, of course, but the words “through the looking glass” have been reiterated thousands of times and no longer allude just to Alice’s strange journey but to the magical distortions that follows when anything passes into an alternative worlds. “Graffiti through the looking glass” succinctly points to the distortion that happens when street writing is picked of its material, public setting and plopped onto a digital wall: the magical social wall of the internet. Under this title, we are each stepping into the “curatorial culture” of our times to digitally curate our own collection of 5 to 10 graffiti piece. Selection and annotation is an important part of the project. Out of the overwhelming number of works that have caught our attention this term, which pieces do we choose to create our handpicked assemblies? We’re looking to create new combinations to think about graffiti. The second part of the project requires making sense of the collection in a way that invites our readers to take time to look at the writing on the wall with a new understanding of what it says. Copyright © 2019 On the Wall. All Rights Reserved.